Pending. That’s been the status of Amira Elamri’s asylum case for more than three years. Elamri, her husband, and their two children fled war-torn Syria in 2013, moving first to Lebanon before arriving legally in Massachusetts in March 2014. They applied for asylum, were granted temporary permission to stay, and were given work permits. So far, however, they have no idea how long they’ll be allowed to remain in the United States. Or even if they will. A significant and growing backlog of immigration cases has left nearly half a million immigrants in limbo, deprived some families of income, and torn at the fabric of others, according to a new report by the US Government Accountability Office. And with calls for increased enforcement under the Trump administration, it will probably get worse. Already this year, there has been a nearly 38 percent increase in arrests for immigration violations when compared with the same time last year. The logjam has more than doubled over the past decade, growing nationally to more than 500,000 cases in 2016. In Boston, there was a backlog of 11,271 immigration cases in 2015, up about 15 percent from 2012, according to the report. Myriad factors have contributed to the growing backlog, including a surge in new cases in 2014, many involving unaccompanied minors, a lack of translators, the increasingly complex nature of the cases, recent decisions by the US Supreme Court, and lawsuits by immigrants. Additionally, the number of immigration judges has not kept pace with the increase in cases, despite the court system’s hiring of 35 new judges from 2006 to 2015, the report said. There were 289 immigration judges nationwide in 2016, but almost 40 percent of them are eligible for retirement, the report said. Congress has allocated funds for the immigration court system to hire more judges, but an arduous — and slow — hiring process keeps fewer judges from sitting on the bench than needed, the report said. It took an average of 742 days — or just over two years — to hire a new judge between 2011 and August 2016, the report said. The hiring delay was attributed to a variety of reasons including a federal hiring freeze, delays with background checks, and human resources staffing shortages. It was a beleaguered system even before President Trump rescinded guidelines set by his predecessor that prioritized arresting the most serious criminal offenders over other immigrants in the country illegally. Cases pending in the nation’s 58 immigration courts include everything from people facing deportation for overstaying a visa or illegally entering the country to those seeking asylum for children entering the country without their parents. There are individuals and families in custody while their cases are pending, and others who are free on bond but must check in with immigration officials. Lafaille said the ACLU began representing clients in a 2013 class-action suit that argued they should be released from custody while fighting deportation. In 2014 the plaintiffs won the right to be free on bond while their cases were pending. “There can be years of back and forth between the immigration courts and the board of immigration appeals and the circuit courts,” she said. Immigration advocates say the delays breed uncertainty, which increases anxiety and fear, especially among those seeking asylum and families that have members with different immigration statuses. 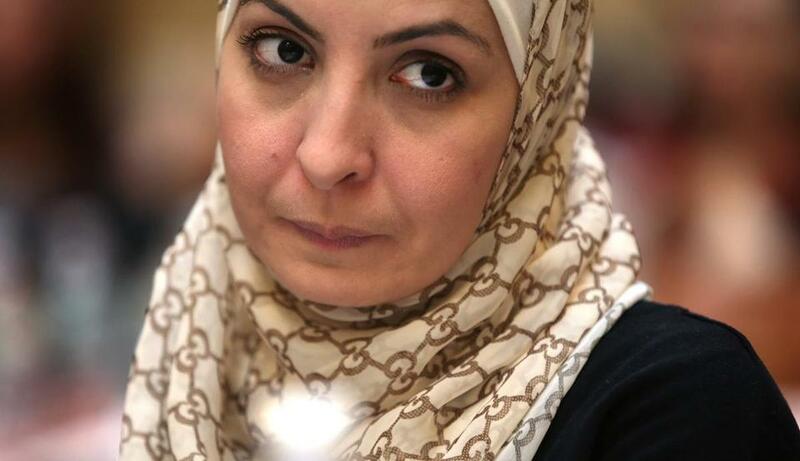 Elamri and her husband, Bassel Aldehneh, said the decision to leave Syria wasn’t easy. He owned a travel agency and she was a schoolteacher when the civil war started there in 2011. Their children, who are now 7 and 11, “became experts, actually, at knowing what kind of weapon was being used,” she said. But they don’t know if they’ll be able to stay. It can take up to three years for those seeking asylum to be granted the necessary hearings, leaving them, in some instances, separated from spouses and children who remain in perilous situations as they wait, according to Anita Sharma, executive director of the Political Asylum/Immigration Representation (PAIR) Project. Immigration judges must adjudicate what are essentially life-and-death cases in what is akin to traffic court, Lafaille said, referencing an often-used comparison by Dana Leigh Marks, an immigration judge in San Francisco and president of the National Association of Immigration Judges. “That really captures the strain that judges are put under with this tremendous backlog,” she said.